Only one mouse click is enough to get trends or pie charts, reveal leaders and outsiders in all parameters like region, product or in any others. 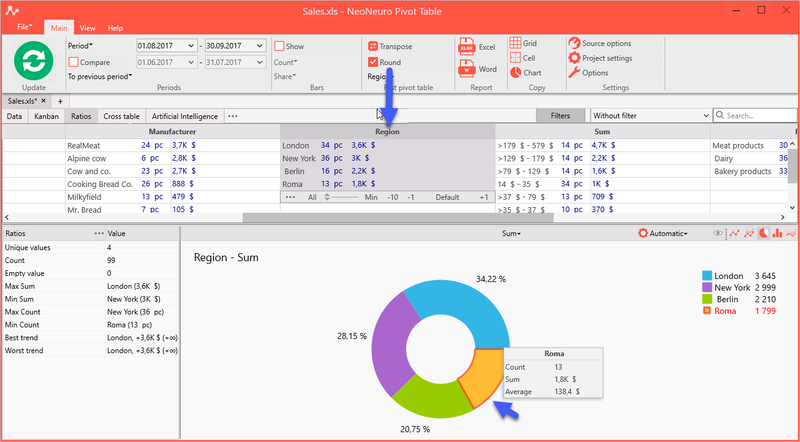 Use filters to get answers for complicated questions like “How did milk sales change in New York for the last month with dependence on package type?” Do not bother about data overwhelming – NeoNeuro Pivot Table automatically identifies the most important values and puts the rest into “Others” group. Detailed financial analysis of even a few number of indicators raises incredible large number of values and charts. It is very difficult to deal with all of them. Any particular report misses many values which can be of great importance for us. Sales analysis of 20 products in 10 shops for last 12 months. This is 20 x 10 x 12 = 2400 values of sums. We can analyze also counts, shares, average values, compare accounting and base periods. If we add analysis of other parameters like product types, packages, providers, then the number of values can be more than a million soon! Automatically analyze all parameters and give the important indicators for them: sum, count, share of sum and count, change for accounting period. Provide convenient filtration when we can recalculate indicators only for one cell, for instance for “Product 1”, and information in all parameters (like shop or Pack) will be shown only for this cell “Product 1”. This solution implemented in a software NeoNeuro Pivot Table. Table shows sum, count of sales and trend by sum in every cell. Below is the sales diagram for last week. Green and red arrows show the direction of changes; big arrows specify the largest changes. Bottom left window shows detailed statistics. Full pivot table – special type of pivot table where all parameters filled with their types and two indicators: sum and share by sum. Information panel in left bottom show indicators for selected parameter (on screenshot) or cell. Chart and information panel change by clicking on different cells of Full Pivot Table.